Now, Forest School becomes even more accessible with the publication of Play The Forest School Way, (US/UK) a woodland adventure book. This book is packed full of outdoor activities for parents and children. Ideas include making nature jewellery, constructing a bow and arrow, foraging for food and making a fire. The book is written by Jane Worroll, an ex-countryside ranger, and Peter Houghton, a trained Forest School leader. We have FOUR of the wonderful activities for you to print out from the book for free, but don’t let it stop there. Play the Forest School way (US/UK) has lots of other wonderful activities and it only costs £9.95/$13.95. The Forest School movement encourages self-esteem, confidence and social skills through nature play and there have been a number of articles on the movement with Chris Evans also recently singing its praises on his Radio 2 show. This beautifully illustrated book is perfect to take on a summer holiday to the countryside or to use as an activity book for kids and parents when looking for things to do during the summer. Play The Forest School Way (US/UK) will help kids connect with nature (and their parents! ), learn new skills, be adventurous and have fun, with woodland games, crafts and more… The book is written for parents, teachers and guardians and the activities are suitable from pre-school to age 11. There is nothing better than a bit of messy play to get the kids excited about their forest school activities, and this is just a perfect activity for this. 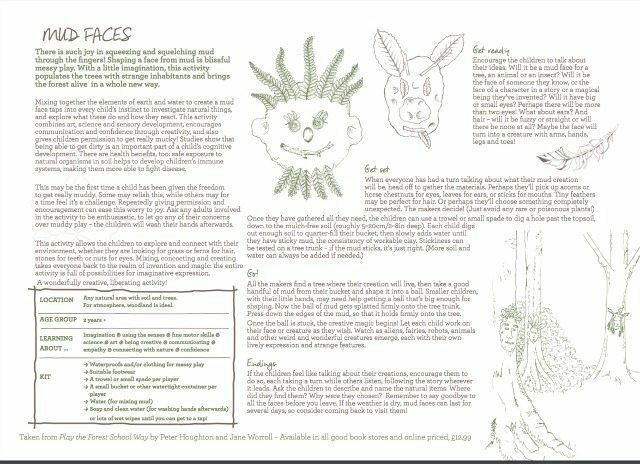 Kids love to explore, and mixing earth and water to make mud faces can create some magical folk of the forest for your kids to hang out with. 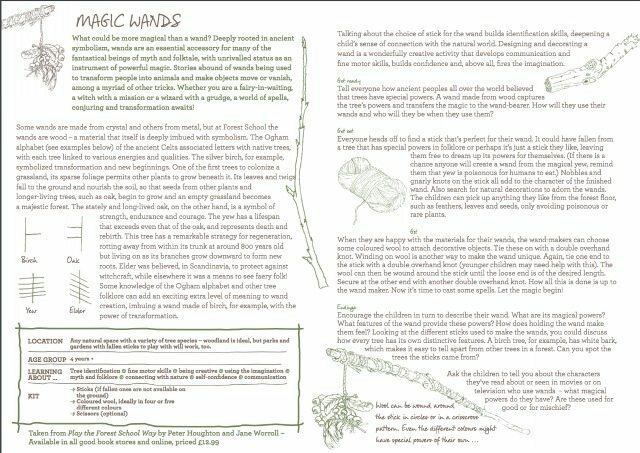 There is NOTHING more magical than making a wand in the woods, and every aspiring little Harry Potter will love to do it. Why not teach the kids all about the different woods available in the forest at the same time as well? 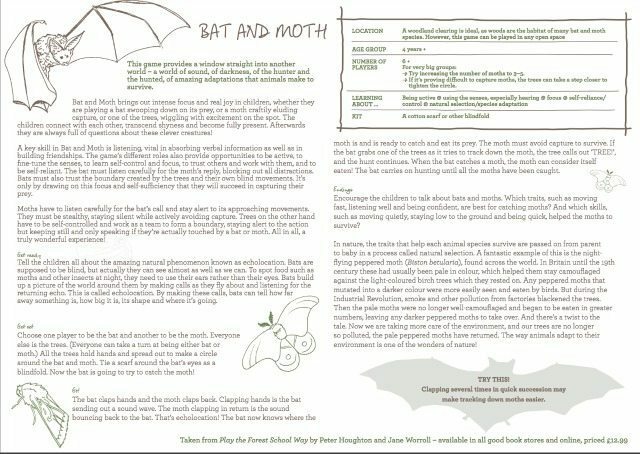 This is a wonderful game, where the kids learn to be a bat, a moth or a tree within the forest. They learn about Echolocation, and use their imaginations to try and feel how a bat swoops between the trees, or a moth evades capture. A great forest activity, and one the kids will remember doing long after the forest school trip has ended. There is nothing like a good scavenger hunt to get the kids in the forest school mood! This forest school activity is tried and tested, and won’t disappoint; so get searching! We have a little board for the kids to use, and instructions for you so you really get into it with this. Come on – can you hear the sound of the wind? 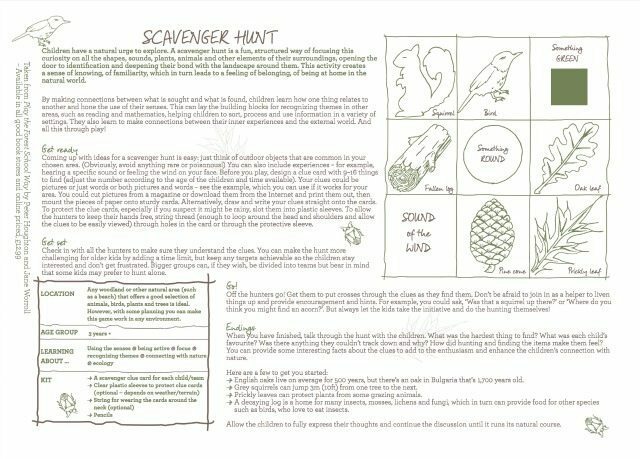 These are only four of the wonderful activities that are featured in the forest school book; Play the Forest School Way (US/UK). 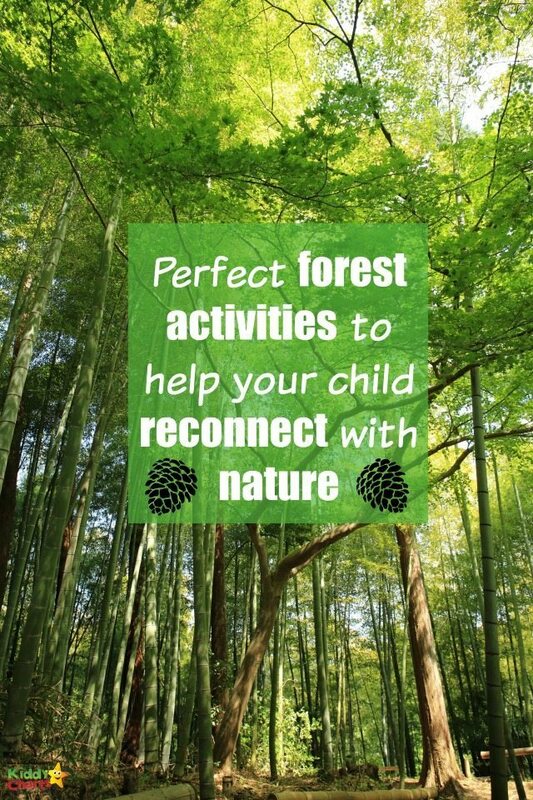 Why not check it out for more great activities and have fun in the forest with the kids today. We have some excellent activities for kids elsewhere on the blog – why not check them out too? Some personalised summer camp printables for you as well. You can check out activities and printables for lots more too – bound to be something that you like there. How about using circle time to intro kids to the forest from Teach Preschool. Why not check out my forest school pinterest board too? Happy climbing, and messing everyone. Thanks for sharing this informative and necessary post and it is our duty to teach children about nature importance.